A full day adventure to the island of Hoy. 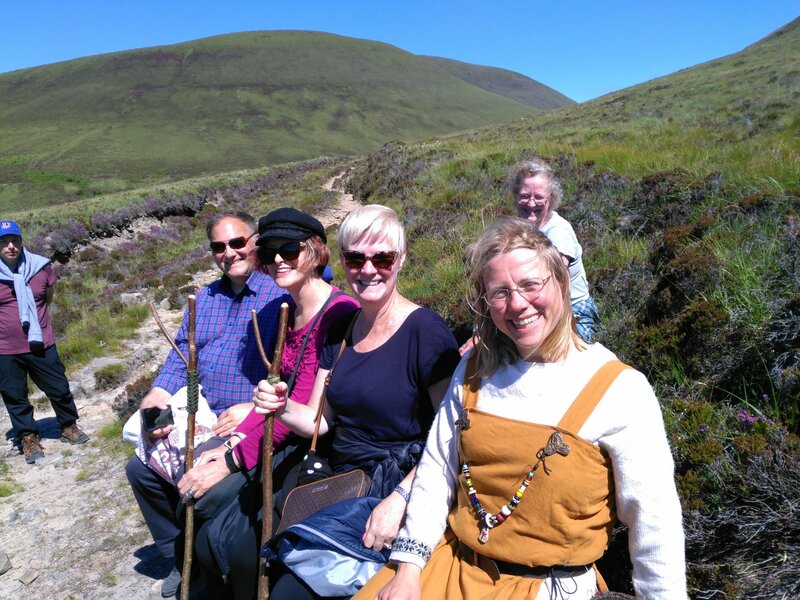 Enjoy a guided walk through a spectacular wild landscape while learning about Viking Age Orkney. Lasts: 7 hours, you will be back in Stromness for 5 pm. Cost: £60 (adults), £40 (age 18 and under, 60 and over, students). Includes ferry transport Stromness – Hoy return and minibus back to pier. The day starts by taking a small passenger ferry from Stromness across to the island of Hoy. From Moaness pier we walk though the roadless valley between the famous Hills of Hoy, said in local folklore to have been dropped there by a giant when the strap broke on his two straw baskets carrying soil for his garden. On the way, we have time to enjoy the fresh air and the stunning, unspoiled Orkney landscape until we reach the secluded valley of Rackwick. 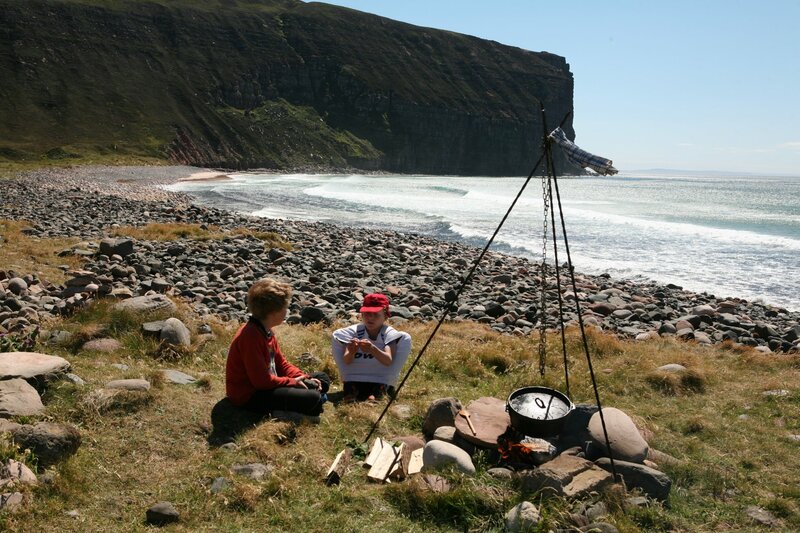 Once inhabited by the Vikings, Rackwick now lies undisturbed, like a green bowl surrounded by imposing cliffs in old red sandstone. We stop on the beach, by the old stone bothy, built in a style reminiscent of a Viking longhouse. Here, we set up camp. We are met by an outdoor cooking and wilderness survival expert, who lets us into the secrets of the Viking way of life. 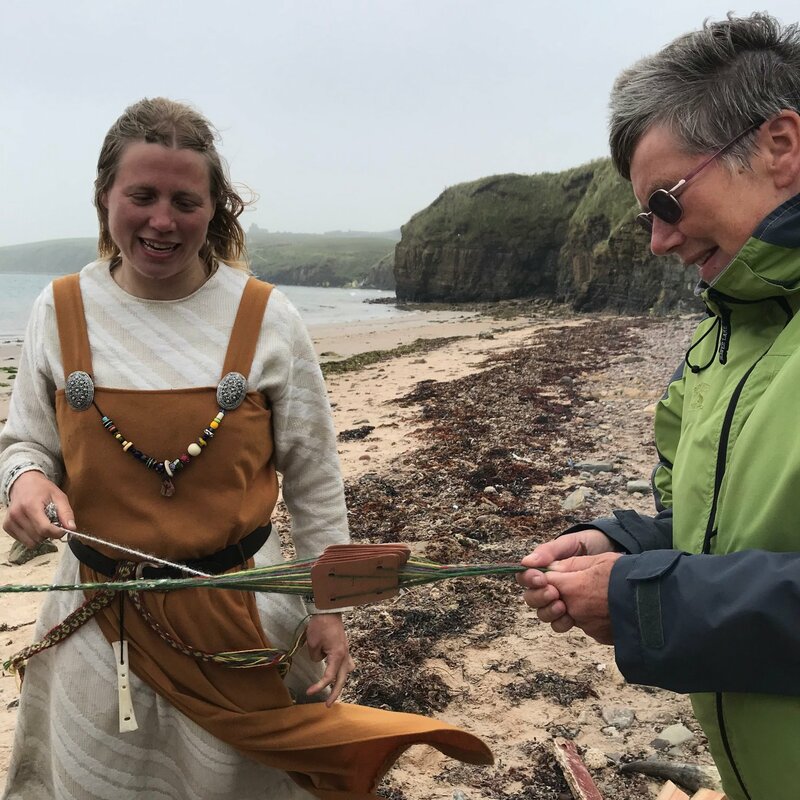 You will have a go at practical skills such as weaving and braiding techniques and nettle rope making. We cook over open fire and share an authentic Viking meal by the campfire. 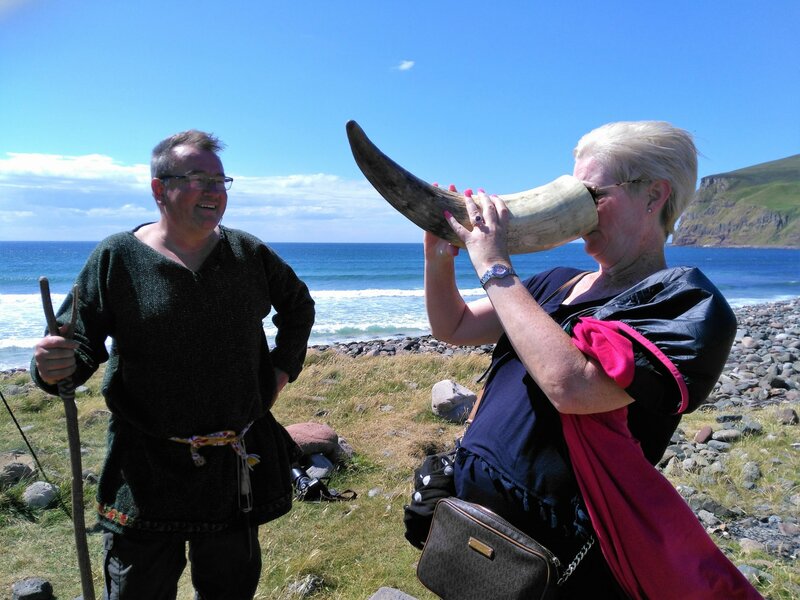 We play games, hear Viking songs and try a Viking dance, and listen to ancient stories passed down from the Vikings in the sagas and through local tradition in Orkney. Please wear good clothes suited to the weather. Warm and waterproof clothing may be necessary. Also please wear sturdy hiking boots. It may, at times, be wet underfoot. The hike goes through a valley where there is no road and no groomed trail. Viking food is included, but please bring a bottle of water and an extra snack should you get hungry on the way. Ferry ticket to Hoy and bus transport back to the pier is included in the price. Take bus service X1 to Stromness. It runs from St Margaret’s Hope via Kirkwall Travel Centre to Stromness. Get off at the Northlink ferry terminal and walk a short distance to the harbour, where we will meet by the statue of arctic explorer John Rae. We will board the small Graemsay/North Hoy ferry together. The day also ends at Stromness Harbour.